Everyone has their own unique story! There is no possible evidence that their stories are all perfect as well as good. Sometimes, some stories are not flawless! Even so just remember these flaws will not be with us forever. Moreover, remember no one can change their own past. So instead of worrying, try your best to more forward and imagine yourself as a clock. A clock is a machine that tell time an also teaches us all the value of time as well as life. As a child, my mom taught me that when things go wrong in life rather than locking myself away from the world I should learn to move forward like a clock! “A clock only goes forward! that holds a better future. So, it depends on us to look over the flaws and be happy with what lies ahead of us. since tomorrow is right in front of you! what beautiful colors on a dreary day! at least it's dreary where i am! Hi Harija, Your cape is so beautiful and such a glorious piece for winter, looks lovely. I am always grateful for your kind comments...Have a great week ahead! You look amazing. I love the stunning colors. Great words of wisdom and you mom is right about it! I'm not kidding but this post is amazing not sure how the outfit relates to the poem but just amazing. 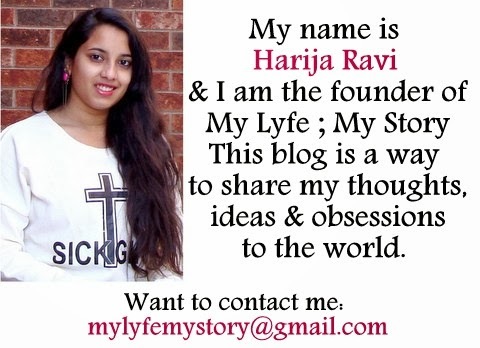 Wow, Harija you look stunning! Look Great!, So floral!, So pretty! Anyway, love the cape. Stay warm! Great look doll, love your cape! Your word are so intense! Beautiful outfit and your are so brave to be in the cold taking pictures. I love capes and this one is certainly more interesting and lovely than most! Love the floral detailing and don't you adore how comfortable yet stylish capes are? You are reminding me that I need to wear my cape again very soon! I love your floaral cape... great combo doll!!! aww this is such a pretty outfit! your floral cardigan is so unique and pretty i love it! You're looking awesome! And wow, there's even snow at your place, I'm happy there's no in Switzerland! Really like your pink top. Wow, amazing sweater! We just stopped by to say hello. We're a shaving company called Dorco, and while you may not have heard of us yet, we're changing the way razors are done in the U.S. and Canada. Our razors cost up to 70% less than the big guys'. But that doesn't mean you have to sacrifice the quality of your shave. Our razors are crafted with the highest quality blades and moisturizing strips containing aloe and vitamin E to soothe and hydrate even the most sensitive skin. Read what others think about our products and our prices at DorcoUSA.com. Thanks again for sharing this look with us; such gorgeous colors! Very cute! I love a good sweater, especially in this snow! Bonjour Harija! Your outfit reminds me of Kenzo Takada's work in the 80's : very fresh and pretty. I couldn't comment on your previous post but I would add Belize and Zanzibar to your list of vacations. To be fair, your list is already quite long and I hope I will see all these places in my lifetime. Cool photos! Thanks your comment on my blog! Lovely!! perfecto to cheer this winter up! love it. Omigosh, this is amazing! at first I thought it was scarf, but ti's so cool! I absolutely love the ensemble!!!! You're so perfect! You look gorgeous and already tuned with the season trend of ethno prints! First of all, you look amazing. Lovely look. Love the cardi, it's beautiful. Un cardigans totalmente diferente, me gusta mucho. Un beso. Estamos de sorteo de una prenda de manos de RoseWholesale. Último día para apuntarse, no te lo pierdas. how beautiful is your scarf!